The sweet Comfort & Harmony Portable Swing with its plush, roomy seat gives your little one a relaxing place to swing. It has all the elements that keep baby comfortable and happy at every touch point and TrueSpeed™ Technology. 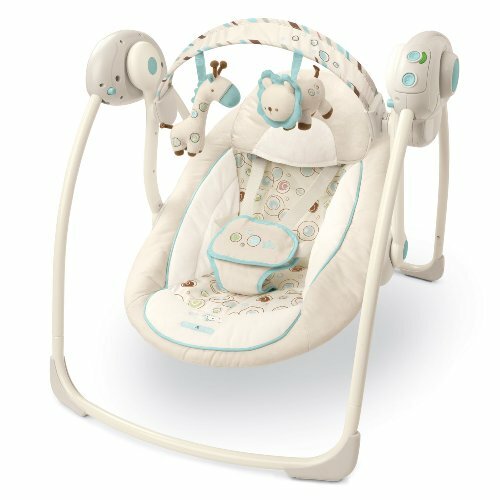 This innovative feature automatically recognizes your baby’s weight and adjusts the swing’s motion to maintain consistent, soothing swing speed even as baby grows. Features: Plush, over-sized seat with cushioned foot pillow and removable head support in the softest fabrics Comfort Recline™ offers 2 full-body recline positions for baby’s ultimate comfort Whisper Quiet™ operation 6 swing speeds and swing timer with 3 settings: 15, 30, and 45 minutes 6 calming melodies with volume control and auto shut off Removable toy bar pivots back for easy access to baby 2 engaging toys: plush Lion and plush Giraffe Easily folds for storage and travel 5 point safety harness Seat pad is machine washable Specifications: Ages: Birth & up For infants up to 25 pounds Requires 4 C batteries, not included Gift Wrap not available.